Using E-Spire Retail meant that with our extensive Project Management, Skilled Installers and nationwide support distributing equipment amongst others, ensured detailed signoffs were attained. An element of night and day shifts were operated to complete the review allowing stores to trade. Do not send anymore emailsCheck this box if do not wish to receive further emails from E-Spire Retail. E-Spire Retail were asked to support Homebase with their 2016 Lighting Review. 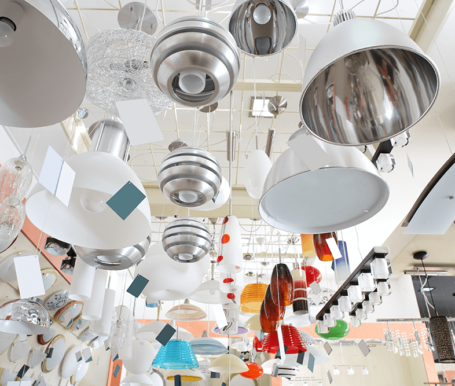 E-Spire Retail converted the lighting departments within 140 Stores across UK and Ireland with new lighting ranges changed across Pendants, Wall, Spots, Bath, Flush and Shades. Whilst some existing metalwork and electric track systems were re-used, all old style format displays and boards were removed and new light models assembled and fitted using new Bunnings equipment and planograms. After gathering a full understanding of the project and completing trial stores, E-Spire Retail carefully briefed our installers ensuring specific equipment knowledge, build and safe working practices. E-Spire Retail ensured the Electrics at all Homebase lighting departments were isolated as part of the supported works prior to rollout. E-Spire Retail managed up to 20 teams to complete the changes, provided full Project Management support, communications with stores and Homebase Project Lead Managers including pre calls, daily updates, equipment consolidation and reports. E-Spire Retail has continually delivered retail standards as per Homebase expectations and throughout the lighting transition provided robust reporting that was paramount to plan each stage of the review and gave confidence and reliability to the client.